Junior jetsetters, powered by washable pens, can cross continents and create their own local color. 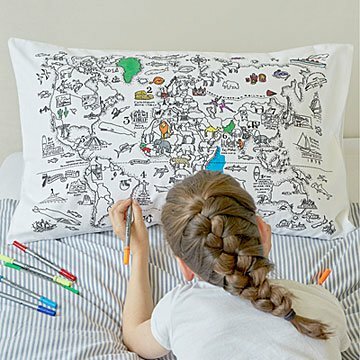 We don't know which kids will love more about this color-able pillowcase: making their mark on every continent, or breaking all known rules of where it's ok to color. With the included fully washable colored fabric markers, they can take pen to pillow, color the world's wonders, rest their head on their art, and dream all night of amazing distant lands. When laundry time arrives, the ink will wash out, leaving a fresh canvas for new artistic trekking—and new geography-inspired dreams. Pillowcase made in Turkey. Markers made in China. Pair your pillows with this Color Your Own Map Duvet. Machine wash with warm water. I bought these for my kids (ages 4 and 7) for Christmas, and although they didn't quite "get it" at first, they are LOVING these at bedtime now! It's a brilliant way to get them to calm down at bedtime while listening to an audiobook. The world map one is my favorite. My daughter is already noticing the geography and pointing out countries and continents. It looks to me as though the markers will run out of ink pretty quickly. Hopefully there's a way to buy replacement packs? My 8 year old uses this to color in her latest trips. I bought these pillowcases for my ten-year old and seven-year old. They both have had fun with them. The colors are nice and bright, and it makes for a relaxing, pre-bedtime activity. And he's having fun and that makes me hapoy. Washable, comes with everything you need. Great gift for young artists!